The base stock from which all modern day koi come from are called Magoi. Magoi is what the Japanese and Chinese consider the common carp, known to be a black carp. However Magoi will typically exhibit a bit of bronze in its coloring, and an easily distinguishable orange to white belly color. Magoi is not truly black koi. Karasugoi are the true black koi. Karasu have been bred in Japan for quite some time. They are the crows of the koi varieties, and the term Karasu means crow in the Japanese language. The crow is known as a messenger of divine intervention in Japanese mythology. Even though the base was there to create a black koi from the Magoi ancestry, alot of work had to go into breeding and fixing the variety of Karasu. 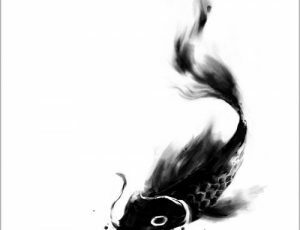 Some koi lore claims that the black koi came about almost spontaneously after World War 2 in which the nation of Japan had atomic bombs detonated on the Island; these detonations perhaps playing a role in the transmutation. Others maintain the lore that black koi were being bred prior to World War 2, with intent for the metamorphosis to black. Perhaps we’ll never truly know how Karasu came to be, but isn’t that part of the mystery of the color black. 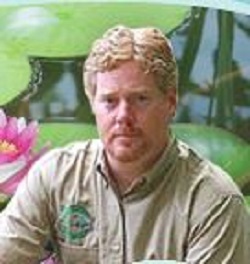 These days however, black koi are bred not just in Japan but from numerous sources with Philippines and Indonesia having some active production rates of black koi. The color black has always held culturally strong significances. How you perceive the color black and how it affects you will likely be driven by your cultural upbringing. In many cultures the color black is the color of sophistication, sexiness, and power. There are the tuxedos and little black dresses of high society. Authoritative and powerful figures will typically dress themselves in black. Judges, law enforcement, priests, ninjas, and Johnny Cash all effectively used the color black as a message of strength and dominance. Of course, black can have some very negative connotations such as death, sin, affliction, sadness, mourning, and the occult. Black can be just plain bad luck in many cultures. To have a black koi in your pond will be to have a source of good luck, as Japanese tradition would have it. The black koi is considered very good luck. Some would take it a step farther and say that black koi are not simply good luck. Better yet, black koi absorb negative energy, promote a restful contemplative feeling, alleviate life obstacles, and invite wealth into the life of the pond keeper. On childrens day in Japan the tradition of flying colorful koi flags representing family members sweeps over the country. The black koi flag represents the father figure. Black koi add great mystery to your pond, gliding almost imperceptibly against the pond bottom, providing stark contrast to the more colorful koi in your pond. How comforting is it to know you have a Karasu making its rounds in your pond collecting up all the bad luck, negative energy, and obstacles; while making your coffers full. I’ll take 2 Karasu por favor. When choosing your Karasu use all of the typical criteria and precautions for purchasing koi. No cuts, scrapes, abrasions, torn fins, red streaks, hazy eyes, or missing scales and so on. Look for sharp and deep black coloration, the more jet black the better. The belly area having as much black as possible is desirable. An orange belly is preferred over a white belly where black does not cover. Fins and tail should be black, no white. Black around the eyes preferable. Karasu do not require any special care beyond the typical requirements of all koi. And they are unaffected by color food, so there’s that… but there’s more. They will grow up to a nice 3′ length when given the room. Many of the Karasu koi keepers report them to be very good eaters with healthy appetites, so keep the treats handy. Karasugoi would be great candidates for a hand fed pet koi. They will quit eating when you are ready to quit feeding! Typical Karasu will also enjoy a long life span with 30+ years, which is not an unreasonable expectation when cared for properly. Koi become family pets due to their long lives. And everybody knows the critically important rule when keeping more than one Karasu, they must be kept in odd numbers only; we all know what happens otherwise. Karasugoi are a great addition to any koi collection. They are the most pleasant surprise in most collections since they are not always easily visible. Always a conversation starter. Their black skin glistening in the sun is a striking sight to see during feeding times and other breaches. And let’s face it having a jet black koi is just plain cool. Karasu will often become a favorite fish in spite of the missing reds, whites, orange, and yellows that koi are loved for. Koi keepers who take the plunge and add Karasugoi to their ponds will find out that black koi do matter, indeed. Go ahead and join the Karasu movement.